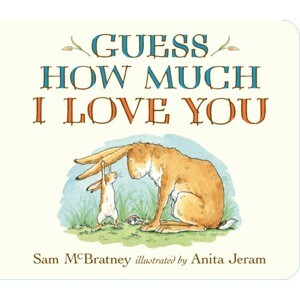 Now through November 23, Target is offering a 40% off cartwheel for Sam McBratney's Guess How Much I Love You books. The board book is currently on sale for $5.59 (regularly $7.99) and with the 40% off the price drops down to just $3.35. If you are shopping online, first apply the Cartwheel and then add the item to your cart and select free in-store pickup at checkout. A bestselling bedtime book, Guess How Much I Love You tells the sweet tale of tiny Little Nutbrown Hare putting off sleep just a little longer by sharing his feelings of love for his father, Big Nutbrown Hare. The two engage in an endearing, heartfelt competition about who loves the other more.